Looking for the getting started guide for the free version? Thanks for purchasing the Premium version of Simple Page Tester. The Premium version contains various features surrounding conversion tracking and conversion statistics. This guide will tell you how to get started with implementing these. After you have created the split test, a small meta box will appear on the right hand side of the split test edit screen. By default it only shows the shortcode as this is the simplest option and will the option most users utilise. 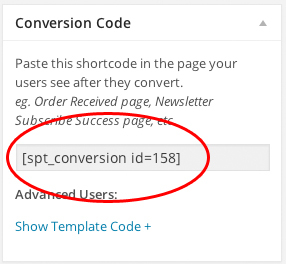 All you need to do to enable conversion tracking is to paste this shortcode on the page that you customers see after they convert. The template code is meant for advanced users who edit their page templates and need to enter their conversion tracking via PHP code. This function call will record a conversion for this specific split test. Conversion are tracked by using a session data variable. This tracks which variation was last seen by the user when they convert. Conversions statistics are all automatically enabled when you install Simple Page Tester Premium. Once you start receiving views and conversions on the pages involved in the split test the statistics data will automatically populate. 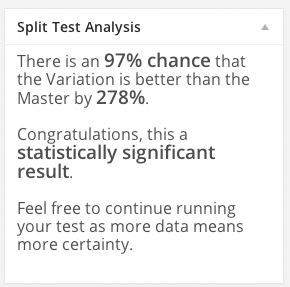 There is also a Split Test Analysis meta box on the right hand side. This shows you what your results mean and whether it’s a mathematically statistically significant result. It tells you what the chance is that one variation is better than another, by how much and whether it’s statistically significant. Of course there are some caveats to this analysis, one being that this is a mathematical equation which means you can get statistically significant results from a very small amount of views/conversions. What I recommend is setting a minimum amount of views that you wish to achieve and check the Split Test Analysis at that point. The more data (views and conversions) you have the more certainty you can have in the results as reported by this meta box. That concludes the getting started guide for Simple Page Tester Premium Version. We hope you have fun with the plugin and it helps you improve your website.